From the seventeenth century onwards the Van Bourgondiën family mainly lived in the present-day provinces of Noord-Holland and Zuid-Holland in The Netherlands, but during the twentieth century several family members emigrated to the USA. This was largely stimulated by the bulb growing activities of the Van Bourgondiën family, because business contacts in order to expand their trade to the American market eventually lead to a permanent settlement in the USA. These business contacts can at least be traced back as far as 1904, but they might be older. This genealogical overview is focusing on the members of the Van Bourgondiën family who emigrated to the USA between 1900 and 1950. It is definitely not complete: the research is still going on. Especially the history of the different companies needs to be studied further. 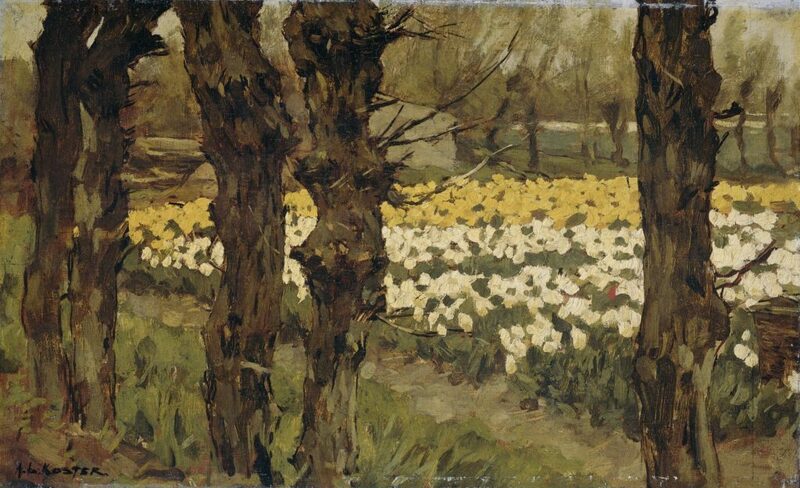 Field with yellow and white tulips, surrounded by trees, painting by Anton L. Koster 1880-1937 (coll. Rijksmuseum Amsterdam). I. KAREL (CAROLUS) VAN BOURGONDIËN, farmer, horticulturist and bulb grower (1845-†), founder of K. van Bourgondiën & Zonen in Hillegom, born August 14, 1820, in Hillegom, died January 28, 1892, in Hillegom, married May 17, 1846, in Lisse, GEERTRUIDA DE WAAL, born December 14, 1819, in Lisse, died July 28, 1894, in Hillegom, daughter of Cornelis Geerlofsz de Waal, innkeeper and farmer, and Johanna van Os. Karel van Bourgondiën (a.k.a. Carolus van Bourgondiën) was the founder of the bulb growing company K. van Bourgondiën & Zonen in Hillegom (1845). This company had 20 acres of land at its disposal. At first Karel van Bourgondiën grew flower bulbs for the Dutch market, but from 1875 onwards he exported them to countries like Germany, Austria, Hungary and Czechoslovakia. In 1856 Karel van Bourgondiën built a new house in Hillegom. It was situated on the farm that he had inherited from his father Henricus van Bourgondiën. A warehouse was attached to it somewhere between 1860 and 1865. This house was later also used by his son Karel van Bourgondiën junior. Unfortunately the house was demolished in 1928. HENDRIKA IMMETJE VAN BOURGONDIËN, born December 22, 1846, in Hillegom, died August 17, 1892, in Rijnsburg, married May 1, 1873, in Hillegom CHRISTIANUS ZANDBERGEN, farmer (1873-1892), born March 27, 1835, in Rijnsburg, died October 11, 1902, in Halsteren, son of Willem Zandbergen, farmer, and Jacoba van Leeuwen; widower of Sophia Prins. THEODORUS VAN BOURGONDIËN, born July 30, 1850, in Hillegom, died December 14, 1861, in Hillegom. EMERENTIA VAN BOURGONDIËN, born November 23, 1851, in Hillegom, died November 7, 1919, in Wassenaar, married February 26, 1878, in Hillegom GERARDUS BOGAARDS, farmer (1878), born May 2, 1850, in Noordwijk, died August 3, 1943, in Wassenaar, son of Gerrit Bogaards, farmer, and Jacoba Korswagen. SUZANNA VAN BOURGONDIËN, born February 27, 1853, in Hillegom, died August 7, 1867, in Hillegom. JOHANNES VAN BOURGONDIËN, born June 12, 1854, in Hillegom, died April 8, 1855, in Hillegom. AGATHA VAN BOURGONDIËN, nun (‘sister Maria Matthea’), born August 6, 1855, in Hillegom, died July 20, 1909, in Amersfoort. PETRUS VAN BOURGONDIËN, bulb grower (1890), born November 13, 1857, in Hillegom, died March 12, 1938, in Hillegom, married June 18, 1890, in Den Haag CORNELIA APOLONIA KUITEMS, born August 14, 1860, in Scheveningen, died March 23, 1936, in Hillegom, daughter of Hubertus Kuitems and Gerritje Heemskerk. JOHANNES VAN BOURGONDIËN, bulb grower (1895), born November 21, 1858, in Hillegom, died June 3, 1895, in Hillegom. Unmarried. ANNA VAN BOURGONDIËN, born March 14, 1863, in Hillegom, died November 5, 1939, in Noordwijkerhout, married May 5, 1887, in Hillegom WILHELMUS RUIGROK, farmer (1887), born November 1, 1856, in Hillegom, died October 21, 1932, in Noordwijkerhout, son of Wouter Ruigrok and Klazina Schrama. PETRONELLA VAN BOURGONDIËN, born May 24, 1864, in Hillegom, died May 17, 1869, in Hillegom. 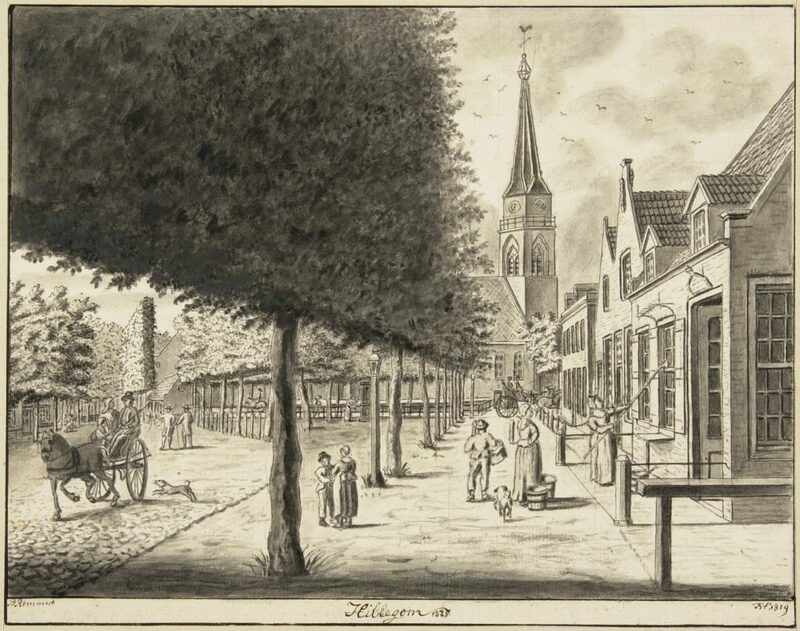 The Reformed Church of Hillegom and surroundings during the time Karel van Bourgondiën (1820-1892) was born, drawing by Pieter Remmers (coll. Noord-Hollands Archief). IIa. CORNELIS VAN BOURGONDIËN, bulb grower (1876-1906), member of the Algemeene Vereeniging voor Bloembollencultuur, section Hillegom (1899-1901), born January 31, 1848, in Hillegom, died January 7, 1912, in Haarlem, married September 20, 1877, in Wassenaar, JOANNA DE BRUIN, born June 13, 1839, in Oegstgeest, died April 9, 1912, in Hillegom, daughter of Leonardus de Bruin, charioteer, and Maria van Seggelen; widow of Johannes Mooijman. KAREL VAN BOURGONDIËN, born February 10, 1879, in Wassenaar, died March 6, 1879, in Wassenaar. IIIa. JOHANNES VAN BOURGONDIËN, bulb grower (1906-1909) and horticulturist (1916), member of the Algemeene Vereeniging voor Bloembollencultuur, section Hillegom (1909), emigrated to the USA, born January 14, 1881, in Wassenaar, died after June 22, 1916, married May 30, 1906, in Hillegom, CORNELIA MARIA JOHANNA TOPPER, born May 1, 1882, in Hillegom, died after June 22, 1916, daughter of Adrianus Topper, innkeeper and bulbgrower, and Hendrica van Schagen. Johannes van Bourgondiën emigrated with his family to the USA. They arrived in New York on June 22, 1916. At first they stayed a while at the home of his cousin Cornelis Johannes van Bourgondiën in Arlington, New Jersey (147 Magnolia Avenue); at least, that was their destination according to the passenger list. Arlington later was renamed North Arlington. Somewhere between 1916 and 1920 Johannes van Bourgondiën moved to Babylon (NY), situated on Long Island. There he was visited by Casparus Hendricus van Bourgondiën (a.k.a Casper van Bourgondiën), a distant relative of Johannes, who lived in Oegstgeest but emigrated to the USA in 1920. 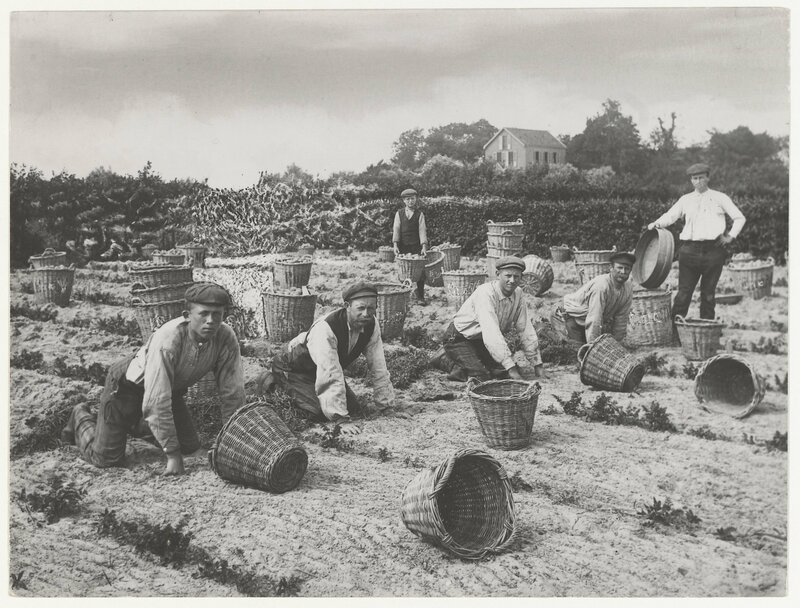 Planting hyacinth bulbs, date and location unknown (coll. Noord-Hollands Archief). IIb. KAREL VAN BOURGONDIËN, bulb grower (1876-1921), municipal councillor in Hillegom (1894, 1897), member of the Algemeene Vereeniging voor Bloembollencultuur, section Hillegom (1899-1909), secretary and committee member of the roman-catholic Armbestuur in Hillegom (1915), founder of K. Van Bourgondien & Sons, Inc., born March 28, 1849, in Hillegom, died March 26, 1927, in Hillegom, married (1) June 29, 1876, in Hillegom, JOHANNA ZEESTRATEN, born December 9, 1852, in Hillegom, died August 23, 1886, in Hillegom, daughter of Hendrik Bartholomeus Zeestraten, farmer, and Cornelia Zandbergen; married (2) April 28, 1887, in Hillegom, WILHELMINA DE HOOG, born August 3, 1862, in Wateringen, died December 17, 1887, in Hillegom, daughter of Petrus Jacobus de Hoog and Francina van Niekerk; married (3) July 25, 1888, in Hof van Delft CORNELIA MARIA KOOP, born August 10, 1860, in Hof van Delft, died October 21, 1947, in Hillegom, daughter of Joannes Hendrikus Koop, baker, and Helena Willemina van der Klugt. 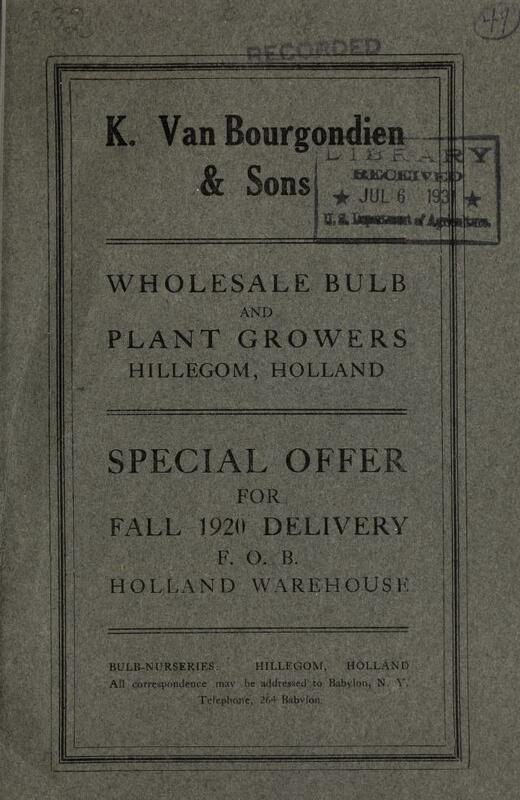 Karel van Bourgondiën exported bulbs to the USA and was the founder of K. Van Bourgondien & Sons, Inc. This company was formed in New York and had a principal place of business in Babylon (NY). According to the passenger lists of Ellis Island most of the overseas business contacts were made through his sons during the first decades of the twentieth century. Just like other growers from The Netherlands they regularly visited Maltus & Ware. This company, located in New York at 14 Stone Street, was founded in 1900 and focused, among other things, on the import of plants and bulbs. Nowadays K. Van Bourgondien & Sons, Inc. sells flower bulbs and perennials online to landscapers, professional gardeners, architects and homeowners. Trade Catalog of K. van Bourgondien & Sons, fall 1920 (U.S. Department of Agriculture, National Agricultural Library, Henry G. Gilbert Nursery and Seed Trade Catalog Collection). Stillborn daughter, born May 12, 1879, in Hillegom. Stillborn son, born February 25, 1880, in Hillegom. PETRUS CORNELIS VAN BOURGONDIËN, born August 14, 1886, in Hillegom, died January 1, 1887, in Hillegom. Stillborn daughter, born December 3, 1887, in Hillegom. JOHANNES HENDRIKUS VAN BOURGONDIËN, born March 28, 1891, in Hillegom, died January 15, 1965, in Haarlem. Unmaried. JOHANNA WILHELMINA MARIA VAN BOURGONDIËN, born February 24, 1892, in Hillegom, died June 14, 1892, in Hillegom. THEODORUS HENDRIKUS VAN BOURGONDIËN, born April 9, 1893, in Hillegom, died March 4, 1894, in Hillegom. GERARDUS WILLEM JOZEF VAN BOURGONDIËN, born. March 31, 1896, in Hillegom, died April 24, 1896, in Hillegom. WILLEM GERARD MARIE VAN BOURGONDIËN, bulb grower, born December 14, 1901, in Hillegom, died April 25, 1982, in Haarlem. IIIb. KAROLUS HENDRICUS VAN BOURGONDIËN, bulb merchant, bulb grower and exporter of bulbs (1954), member of the Algemeene Vereeniging voor Bloembollencultuur, section Hillegom (1909-1923), travelled several times to the USA between 1905 and 1922 to conduct business for the company of his father, emigrated to the USA, born February 19, 1881, in Hillegom, died June 4, 1954, in Leiden, buried June 9, 1954, in Hillegom, married May 12, 1917, in Holland (Michigan) MARIA JOHANNA AGATHA NELIS, born June 13, 1894, in Beverwijk, died October 27, 1939, in Haarlem, daughter of Frederik Nelis and Maria Ludwig. Karolus Hendricus van Bourgondiën emigrated to the USA. He arrived in New York on December 24, 1923. It was definitely not his first visit. Prior to 1923 he made several business trips to the USA as a representative of K. Van Bourgondien & Sons, Inc.
FREDERIK KAREL (FRED) VAN BOURGONDIËN. KAREL CORNELIS VAN BOURGONDIËN (died as an infant). IIIc. HENDRICUS PETRUS VAN BOURGONDIËN, bulb merchant (1904), bulb grower (1909-†), member of the Algemeene Vereeniging voor Bloembollencultuur, section Hillegom (1909), travelled to the USA in 1904 to conduct business for the company of his father, born September 24, 1883, in Hillegom, died March 22, 1927, in Hillegom, married November 15, 1921, in Amsterdam, ALIDA LUCIA ANNA STRAATHOF, born April 21, 1894, in Amsterdam, died May 23, 1961, in Amsterdam, daughter of Johannes Cornelis Jozephus Straathof, company manager, and Cornelia Maria Philomena Kars; she remarried Wilhelmus Adrianus Jacobus Maas. Hendricus Petrus van Bourgondiën never did emigrate, but his eldest son Karel first moved to Indonesia (1941) and then Canada (1956). KAREL JAN (KAREL) VAN BOURGONDIËN. CORNELIS JOSEPHUS (KEES) VAN BOURGONDIËN. IIId. CORNELIS JOHANNES VAN BOURGONDIËN, importer of bulbs, wholesale florist, business owner, member of the Algemeene Vereeniging voor Bloembollencultuur, section Hillegom (1909), travelled several times to the USA between 1907 and 1910 to conduct business for the company of his father, emigrated to the USA, founder of C.J. Van Bourgondiën, Inc., born April 5, 1885, in Hillegom, died February 25, 1970, in West Babylon, married CLARA KESER, born October 9, 1892, died January 6, 1967, daughter of Otto Albert Keser and Elizabeth Bates. This move from Arlington to Babylon most likely had something to do with the fact that the climate and soil in Babylon were perfect to grow bulbs. A total of seven Dutch families settled here, and made Babylon famous for its bulb production. After they moved to West Babylon Cornelis Johannes van Bourgondiën and his family lived in the already existing farmhouse for ten years. In 1929 they commissioned the above mentioned contractor Elmer W. Howell to build a new home on their property in the French Tudor-style. This house (also known as ‘Van Bourgondiën Farm House’) was designed by architect Clifford P. Staudinger from Glen Head (NY). C.J. Van Bourgondien, Inc. was located in West Babylon for more than fifty years. In the early 1970’s the family business was forced to move out of West Babylon and relocate in Peconic (also situated on Long Island). Nowadays the Van Bourgondien Farmhouse (restored in 2012), together with the Van Bourgondiën County Park, are the only remnants of the important role that the Dutch bulb growers played in Babylon during the first half of the twentieth century. IIIe. PETRUS CAROLUS VAN BOURGONDIËN, bulb merchant, bulb grower (1928), member of the Algemeene Vereeniging voor Bloembollencultuur, section Hillegom (1919-1923), travelled several times to the USA between 1920 and 1924 to conduct business for the company of his father, emigrated to the USA, lived in Hillegom and Babylon (NY), born December 6, 1894, in Hillegom, died July 5, 1966, in Arnhem (on a trip to The Netherlands), married August 9, 1928, in Heemstede, EMILIE STEHMANN, born circa 1897, in Hombruch (Germany), died after July 5, 1966, daughter of Franz Hermann Stehmann and Maria Johanna Lochtthowe. Stillborn child, born February 20, 1934, in Hillegom. Most of the present-day Dutch Van Bourgondiëns are still living in those two provinces. The Statue of Liberty – Ellis Island (www.libertyellisfoundation.org), Passenger list of the SS Noordam, July 30, 1904 (page 1), consulted January 5, 2018. WieWasWie (www.wiewaswie.nl), BS Hillegom Geboorte, d.d. 14 augustus 1820, consulted December 30, 2017. WieWasWie (www.wiewaswie.nl), BS Hillegom Overlijden, d.d. 28 januari 1892, consulted December 30, 2017. WieWasWie (www.wiewaswie.nl), BS Lisse Huwelijk, d.d. 17 mei 1846, consulted December 30, 2017. WieWasWie (www.wiewaswie.nl), BS Lisse Geboorte, d.d. 14 december 1819, consulted December 30, 2017. WieWasWie (www.wiewaswie.nl), BS Lisse Overlijden, d.d. 28 juli 1894, consulted December 30, 2017. E.H. Krelage, Drie eeuwen bloembollenexport I (Den Haag 1946) page 25-26 and page 200. Theresa van Bourgondien, ‘Van Bourgondiën family tree’ (circa 1978). WieWasWie (www.wiewaswie.nl), BS Hillegom Geboorte, d.d. 22 december 1846, consulted December 31, 2017. WieWasWie (www.wiewaswie.nl), BS Rijnsburg Overlijden, d.d. 17 augustus 1892, consulted December 31, 2017. WieWasWie (www.wiewaswie.nl), BS Hillegom Huwelijk, d.d. 1 mei 1873, consulted December 31, 2017. WieWasWie (www.wiewaswie.nl), BS Rijnsburg Geboorte, d.d. 27 maart 1835, consulted December 31, 2017. WieWasWie (www.wiewaswie.nl), BS Halsteren Overlijden, d.d. 11 oktober 1902, consulted December 31, 2017. WieWasWie (www.wiewaswie.nl), BS Hillegom Geboorte, d.d. 30 juli 1850, consulted December 31, 2017. WieWasWie (www.wiewaswie.nl), BS Hillegom Overlijden, d.d. 14 december 1861, consulted December 31, 2017. WieWasWie (www.wiewaswie.nl), BS Hillegom Geboorte, d.d. 23 november 1851, consulted December 31, 2017. WieWasWie (www.wiewaswie.nl), BS Wassenaar Overlijden, d.d. 7 november 1919, consulted December 31, 2017. WieWasWie (www.wiewaswie.nl), BS Hillegom Huwelijk, d.d. 26 februari 1878, consulted December 31, 2017. WieWasWie (www.wiewaswie.nl), BS Noordwijk Geboorte, d.d. 2 mei 1850, consulted December 31, 2017. WieWasWie (www.wiewaswie.nl), BS Wassenaar Overlijden, d.d. 3 augustus 1943, consulted December 31, 2017. WieWasWie (www.wiewaswie.nl), BS Hillegom Geboorte, d.d. 27 februari 1853, consulted December 31, 2017. WieWasWie (www.wiewaswie.nl), BS Hillegom Overlijden, d.d. 7 augustus 1867, consulted December 31, 2017. WieWasWie (www.wiewaswie.nl), BS Hillegom Geboorte, d.d. 12 juni 1854, consulted December 31, 2017. WieWasWie (www.wiewaswie.nl), BS Hillegom Overlijden, d.d. 8 april 1855, consulted December 31, 2017. WieWasWie (www.wiewaswie.nl), BS Hillegom Geboorte, d.d. 6 augustus 1855, consulted December 31, 2017. WieWasWie (www.wiewaswie.nl), BS Amersfoort Overlijden, d.d. 20 juli 1909, consulted December 31, 2017. WieWasWie (www.wiewaswie.nl), BS Hillegom Geboorte, d.d. 13 november 1857, consulted December 31, 2017. WieWasWie (www.wiewaswie.nl), BS Hillegom Overlijden, d.d. 12 maart 1938, consulted December 31, 2017. Digitale Stamboom Den Haag (www.denhaag.digitalestamboom.nl), BS Den Haag Huwelijk, d.d. 18 juni 1890, consulted December 31, 2017. FamilySearch (www.familysearch.org), Civil Registration Den Haag, Geboorten 1860 (scan 320 of 500), consulted December 31, 2017. WieWasWie (www.wiewaswie.nl), BS Hillegom Overlijden, d.d. 23 maart 1936, consulted December 31, 2017. WieWasWie (www.wiewaswie.nl), BS Hillegom Geboorte, d.d. 21 november 1858, consulted December 31, 2017. WieWasWie (www.wiewaswie.nl), BS Hillegom Overlijden, d.d. 3 juni 1895, consulted December 31, 2017. WieWasWie (www.wiewaswie.nl), BS Hillegom Geboorte, d.d. 14 maart 1863, consulted December 31, 2017. WieWasWie (www.wiewaswie.nl), BS Noordwijkerhout Overlijden, d.d. 5 november 1939, consulted December 31, 2017. WieWasWie (www.wiewaswie.nl), BS Hillegom Huwelijk, d.d. 5 mei 1887, consulted December 31, 2017. WieWasWie (www.wiewaswie.nl), BS Hillegom Geboorte, d.d. 1 november 1856, consulted December 31, 2017. WieWasWie (www.wiewaswie.nl), BS Noordwijkerhout Overlijden, d.d. 21 oktober 1932, consulted December 31, 2017. WieWasWie (www.wiewaswie.nl), BS Hillegom Geboorte, d.d. 24 mei 1864, consulted December 31, 2017. WieWasWie (www.wiewaswie.nl), BS Hillegom Overlijden, d.d. 17 mei 1869, consulted December 31, 2017. The Algemeene Vereeniging voor Bloembollencultuur (General Association for Flower Bulb Culture) was an association for bulb growers with sections (or branches) in several municipalities; Koninklijke Algemeene Vereeniging voor Bloembollencultuur (KAVB), Weekblad voor Bloembollencultuur nr. 1 (1 juli 1899), nr. 3 (17 juli 1900) and nr. 7 (30 juli 1901). WieWasWie (www.wiewaswie.nl), BS Hillegom Geboorte, d.d. 31 januari 1848, consulted December 30, 2017. WieWasWie (www.wiewaswie.nl), BS Haarlem Overlijden, d.d. 7 januari 1912, consulted December 30, 2017. WieWasWie (www.wiewaswie.nl), BS Wassenaar Huwelijk, d.d. 20 september 1877, consulted December 30, 2017. WieWasWie (www.wiewaswie.nl), BS Oegstgeest Geboorte, d.d. 13 juni 1839, consulted December 30, 2017. WieWasWie (www.wiewaswie.nl), BS Hillegom Overlijden, d.d. 9 april 1912, consulted December 30, 2017. WieWasWie (www.wiewaswie.nl), BS Wassenaar Geboorte, d.d. 10 februari 1879, consulted December 30, 2017. WieWasWie (www.wiewaswie.nl), BS Wassenaar Overlijden, d.d. 6 maart 1879, consulted December 30, 2017. KAVB, Weekblad voor Bloembollencultuur nr. 5 (16 juli 1909). WieWasWie (www.wiewaswie.nl), BS Wassenaar Geboorte, d.d. 14 januari 1881, consulted December 30, 2017. The Statue of Liberty – Ellis Island (www.libertyellisfoundation.org), Passenger list of the SS Noordam, June 7, 1916 (page 1), consulted December 30, 2017. WieWasWie (www.wiewaswie.nl), BS Hillegom Huwelijk, d.d. 30 mei 1906, consulted December 30, 2017. WieWasWie (www.wiewaswie.nl), BS Hillegom Geboorte, d.d. 1 mei 1882, consulted December 30, 2017. The Statue of Liberty – Ellis Island (www.libertyellisfoundation.org), Passenger list of the SS Noordam, June 7, 1916 (page 1) and June 7, 1916 (page 2), consulted December 30, 2017. The Statue of Liberty – Ellis Island (www.libertyellisfoundation.org), Passenger list of the SS Lapland, May 26, 1920 (page 1) and May 26, 1920 (page 2), consulted December 31, 2017. Erfgoed Leiden en Omstreken (ELO), Gemeentebestuur van Hillegom 1812-1946. KAVB, Weekblad voor bloembollencultuur nr. 1 (1 juli 1899), nr. 3 (17 juli 1900), nr. 7 (30 juli 1901) and nr. 5 (16 juli 1909). An institution in charge of the roman-catholic poor relief; J.B. van Loenen, Beschrijving en kleine kroniek van de gemeente Hillegom (Hillegom 1916) 39. WieWasWie (www.wiewaswie.nl), BS Hillegom Geboorte, d.d. 28 maart 1849, consulted December 30, 2017. WieWasWie (www.wiewaswie.nl), BS Hillegom Overlijden, d.d. 26 maart 1927, consulted December 30, 2017. WieWasWie (www.wiewaswie.nl), BS Hillegom Huwelijk, d.d. 29 juni 1876, consulted December 30, 2017. WieWasWie (www.wiewaswie.nl), BS Hillegom Geboorte, d.d. 9 december 1852, consulted December 31, 2017. WieWasWie (www.wiewaswie.nl), BS Hillegom Overlijden, d.d. 23 augustus 1886, consulted December 30, 2017. WieWasWie (www.wiewaswie.nl), BS Hillegom Huwelijk, d.d. 28 april 1887, consulted December 30, 2017. WieWasWie (www.wiewaswie.nl), BS Wateringen Geboorte, d.d. 3 augustus 1862, consulted December 31, 2017. WieWasWie (www.wiewaswie.nl), BS Hillegom Overlijden, d.d. 17 december 1887, consulted December 30, 2017. Collectie Delft (www.collectie-delft.nl), BS Hof van Delft Huwelijk, d.d. 25 juli 1888, consulted December 30, 2017. Collectie Delft (www.collectie-delft.nl), BS Hof van Delft Geboorte, d.d. 10 augustus 1860, consulted December 30, 2017. WieWasWie (www.wiewaswie.nl), BS Hillegom Overlijden, d.d. 21 oktober 1947, consulted December 30, 2017. The Statue of Liberty – Ellis Island (www.libertyellisfoundation.org). K. Van Bourgondien & Sons, Inc. (www.dutchbulbs.com), consulted December 31, 2017. K. Van Bourgondien & Sons of Virginia, Inc. and Simple Pleasures Flowerbulbs & Perennials, Inc. are subsidiaries of this corporation. WieWasWie (www.wiewaswie.nl), BS Hillegom Overlijden, d.d. 12 mei 1879, consulted December 30, 2017. WieWasWie (www.wiewaswie.nl), BS Hillegom Overlijden, d.d. 25 februari 1880, consulted December 30, 2017. WieWasWie (www.wiewaswie.nl), BS Hillegom Geboorte, d.d. 14 augustus 1886, consulted December 30, 2017. WieWasWie (www.wiewaswie.nl), BS Hillegom Overlijden, d.d. 1 januari 1887, consulted December 30, 2017. WieWasWie (www.wiewaswie.nl), BS Hillegom Overlijden, d.d. 3 december 1887, consulted December 30, 2017. WieWasWie (www.wiewaswie.nl), BS Hillegom Geboorte, d.d. 28 maart 1891, consulted December 30, 2017. CBG|Centrum voor familiegeschiedenis, Persoonskaart (personal record card). WieWasWie (www.wiewaswie.nl), BS Hillegom Geboorte, d.d. 24 februari 1892, consulted December 30, 2017. WieWasWie (www.wiewaswie.nl), BS Hillegom Overlijden, d.d. 14 juni 1892, consulted December 30, 2017. WieWasWie (www.wiewaswie.nl), BS Hillegom Geboorte, d.d. 9 april 1893, consulted December 30, 2017. WieWasWie (www.wiewaswie.nl), BS Hillegom Overlijden, d.d. 4 maart 1894, consulted December 30, 2017. WieWasWie (www.wiewaswie.nl), BS Hillegom Geboorte, d.d. 31 maart 1896, consulted December 30, 2017. WieWasWie (www.wiewaswie.nl), BS Hillegom Overlijden, d.d. 24 april 1896, consulted December 30, 2017. WieWasWie (www.wiewaswie.nl), BS Hillegom Geboorte, d.d. 14 december 1901, consulted December 30, 2017. KAVB, Weekblad voor bloembollencultuur nr. 5 (16 juli 1909) and nr. 7 (24 juli 1923). WieWasWie (www.wiewaswie.nl), BS Hillegom Geboorte, d.d. 19 februari 1881, consulted December 30, 2017. WieWasWie (www.wiewaswie.nl), BS Leiden Overlijden, d.d. 4 juni 1954, consulted December 30, 2017. Information provided by John F. van Bourgondien, January 24, 2003. The Statue of Liberty – Ellis Island (www.libertyellisfoundation.org), Passenger list of the SS Aquitania, December 18, 1923 (page 1) and December 18, 1923 (page 2), consulted December 31, 2017. WieWasWie (www.wiewaswie.nl), BS Hillegom Geboorte, d.d. 24 september 1883, consulted December 30, 2017. WieWasWie (www.wiewaswie.nl), BS Hillegom Overlijden, d.d. 22 maart 1927, consulted December 30, 2017. WieWasWie (www.wiewaswie.nl), BS Amsterdam Huwelijk, d.d. 15 november 1921, consulted December 30, 2017. Legacy.com (www.legacy.com), obituary of Karel van Bourgondiën, consulted January 1, 2018. WieWasWie (www.wiewaswie.nl), BS Hillegom Geboorte, d.d. 5 april 1885, consulted December 30, 2017. NYS Historic Newspapers (www.nyshistoricnewspapers.org), The Babylon beacon, d.d. March 5, 1970, consulted December 30, 2017. GENi (www.geni.com), Clara Keser, consulted December 30, 2017. Theresa van Bourgondien, ‘Van Bourgondiën family tree’ (around 1978). The Statue of Liberty – Ellis Island (www.libertyellisfoundation.org), consulted December 30, 2017. NYS Historic Newspapers (www.nyshistoricnewspapers.org), South Side Signal, d.d. February 7, 1919, consulted December 30, 2017. William H. Frohlich, ‘Van Bourgondien Family History’ (draft article March 17, 2012). CJ Van Bourgondien Greenhouses, Inc (www.cjvanbourgondien.net), ‘About us’, consulted December 30, 2017. According to The Long Island traveler-watchman, April 8, 1976, it was urban sprawl and air pollution that triggered the move from West Babylon to Peconic. KAVB, Weekblad voor bloembollencultuur nr. 3 (8 juli 1919) and nr. 7 (24 juli 1923). WieWasWie (www.wiewaswie.nl), BS Hillegom Geboorte, d.d. 6 december 1894, consulted December 30, 2017. WieWasWie (www.wiewaswie.nl), BS Heemstede Huwelijk, d.d. 9 augustus 1928, consulted December 30, 2017. According to the marriage certificate.